Aizawl, Jul 31 : Not a single person turned up on the third day of the seven-day verification camp for Bru refugees at Naisingpara relief camp in North Tripura today. The camp houses 2,469 Bru families. The camp was conducted in four relief camps since June. But barring a woman identified as Porati, no refugee was willing to return to Mizoram. Mizoram additional home secretary Lalbiakzama told The Telegraph today that no refugee turned up at the verification camp at Naisingpara, the largest relief camp in North Tripura. "Bru refugees residing in various relief camps in North Tripura have raised a new set of demands. Only a woman reported at the camp in Hamsapara and was willing to be repatriated," he added. Asked about the fate of the refugees who refused to turn up at the verification centres, Lalbiakzama said the Centre would take the final call. He added that the Supreme Court was also monitoring the repatriation process. Additional deputy commissioner of Mamit Lalbiaksangi told this correspondent over phone from Naisingpara this evening that a team of officials from the three Mizoram districts of Mamit, Kolasib and Lunglei are at the relief camp since Tuesday. He said the identification process is being undertaken to determine whether the Bru families are originally from Mizoram. "Once verification is over and the inmates are identified as original citizens of Mizoram, repatriation will begin," he said. The seventh batch of Bru repatriation began with the identification procedure in two phases. In the first phase, people whose names are enrolled in the electoral rolls in Mizoram would be identified. In the second phase, people whose names are not included in the rolls but who claim to be original settlers would be recognised. The families, which choose not to return to Mizoram, would be deemed permanent residents of Tripura. The refugees willing to return to Mizoram will be rehabilitated in Mamit, Kolasib and Lunglei. The Mizoram government has offered a rehabilitation package of Rs 85,000 for each family along with food allowance for six months. 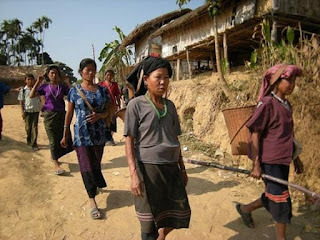 Nearly 34,000 refugees living in North Tripura's refugee camps were driven out of their homes in November 1997 in the aftermath of a clash between the majority Mizos and minority Reangs. Between 2009 and 2011, 3,000 Bru refugees were repatriated to Mizoram from North Tripura. The Bru refugee leaders are demanding higher compensation. They have put forward a charter of demands, which include financial assistance of Rs 150,000 per family, free ration to every repatriated family for two years, cultivable land, political settlement of the ethnic problem and adequate security, among others.